It looks like a German online store has let slip how much the 32-core AMD Threadripper 2990X processor will cost, with a now-deleted page listing it for €1,509 (around $1,700, £1,300, AU$2,300). The store in question is Cyperport, and if its price is correct, it means that AMD will once again be ruthless with its pricing compared to its competitor, Intel. 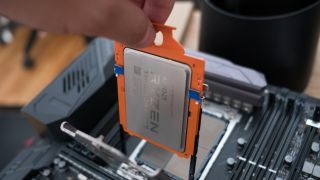 While the price is still a lot for a CPU, it could only end up being around $700 (£300, AU$900) more expensive than AMD’s flagship Ryzen Threadripper 1950X from last year. That came with 16-cores and 32 threads, compared to the Threadripper 2990X’s 32-cores and 64 threads. That’s quite an upgrade considering the potential price difference. If the AMD Threadripper 2990X does come out at this sort of price, it will once again put pressure on Intel, which usually offers much more expensive CPUs. The AMD Threadripper 2990X would actually be cheaper than Intel’s 18-core Intel i9-7980XE, which costs $1,999 (about £1,480, AU$2,510). If the price and specs are correct, the AMD Threadripper 2990X will easily outperform that chip. Intel is also working on a 28-core processor to release later this year, and while that could outperform the upcoming Threadripper thanks to higher clock speeds, it’s also likely to be a lot more expensive. We’re loving the competition between Intel and AMD lately, and it’s great to see that AMD is apparently sticking to its method of selling high performance processors for (relatively) low prices. Hopefully AMD will officially reveal the Ryzen Threadripper 2990X, including its price, soon.